My review of Treasure at Tampines. Former Tampines Court. 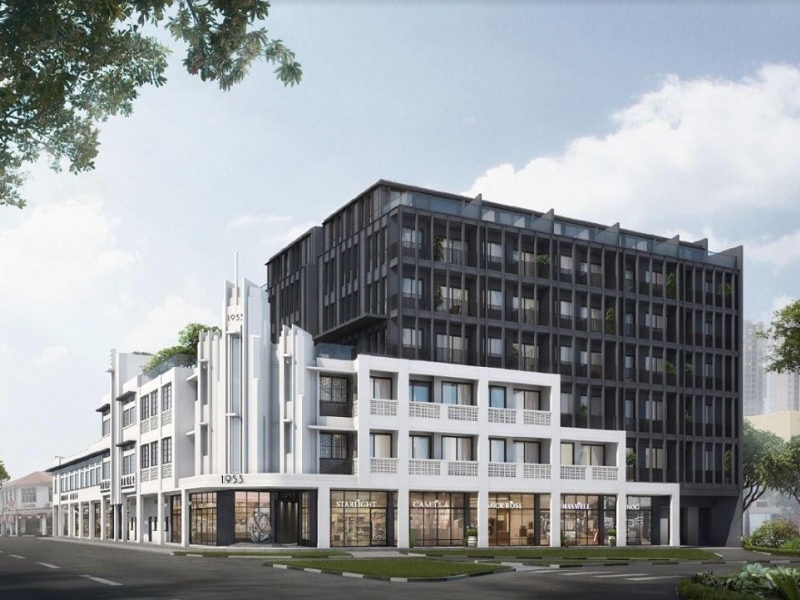 Treasure at Tampines is going to be a barometer as to how the property market would pan out in 2019. 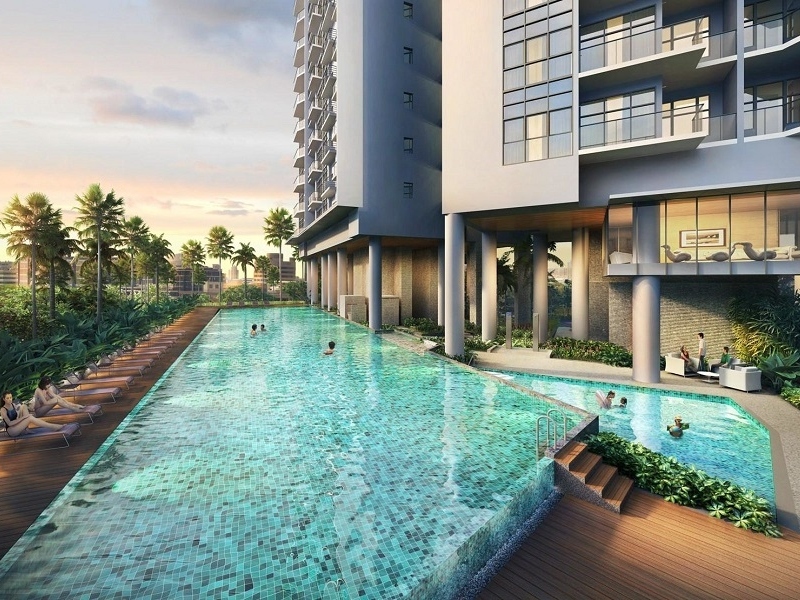 The development will have 2,203 units and will be the largest condominium in Singapore. To put this into a perspective of how massive this development is going to be, the last four property reviews which I did was Fourth Avenue Residences with 476 units, The Woodleigh Residences with 667 units, Kent Ridge Hill Residences with 548 units and Arena Residences with 98 units. 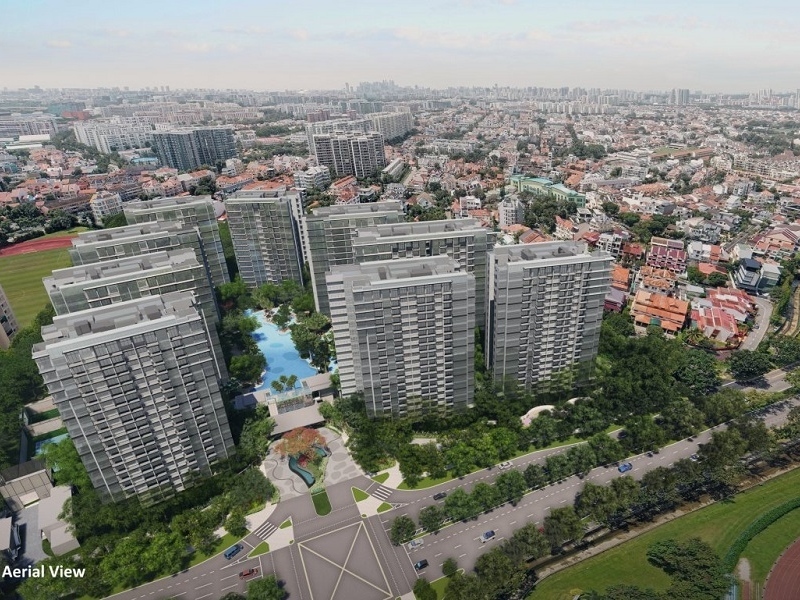 These four developments have a grand total of 1,789 units which is still about 81 per cent of the number of units which Treasure at Tampines will place onto the market. It was rumoured that there was only one bidder for this development as the site was very large. The buyer, in this case, Sim Lian, will have to sell all of the 2,203 units within 5 years of acquiring the land to avoid paying additional buyer’s stamp duty (ABSD) on the land price. 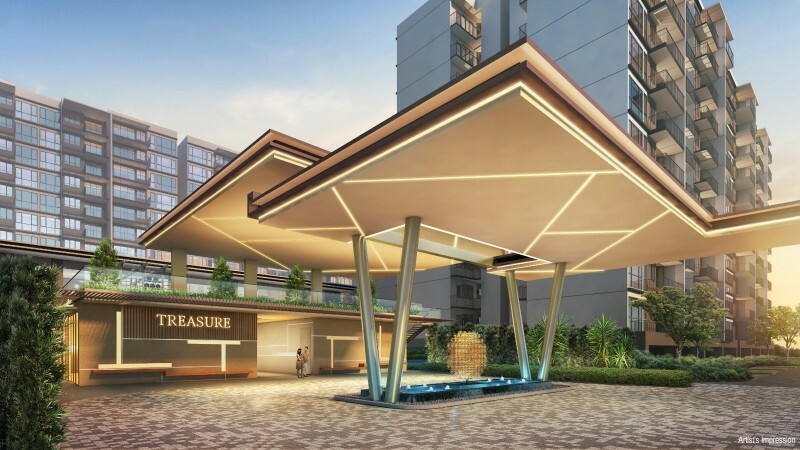 Treasure at Tampines is a 99-year leasehold development developed by Sim Lian. The development will be built on the site of the former Tampines Court, along Tampines Street 11. Tampines court was a privatised HUDC development with 560 units. This size of this plot of land is 701,164 square feet. Sim Lian acquired Tampines Court in an en bloc sale back in August 2017 for $970 million. This meant that each unit owner received about SGD$1.71 million to SGD$1.75 million from the collective sale. Previously the development had failed in two collective sale attempts in 2008 and 2011. The price that Sim Lian paid works out to be about $676 per square foot per plot ratio. Sim Lian will make two payments to the government, one to enhance the intensity of the site to a gross plot ratio of 2.8 and another to top up the remaining lease to 99 years and this will cost the company a further SGD$359 million. Treasure at Tampines is located along Tampines Street 11. It is located close to the PIE entrance and exit. 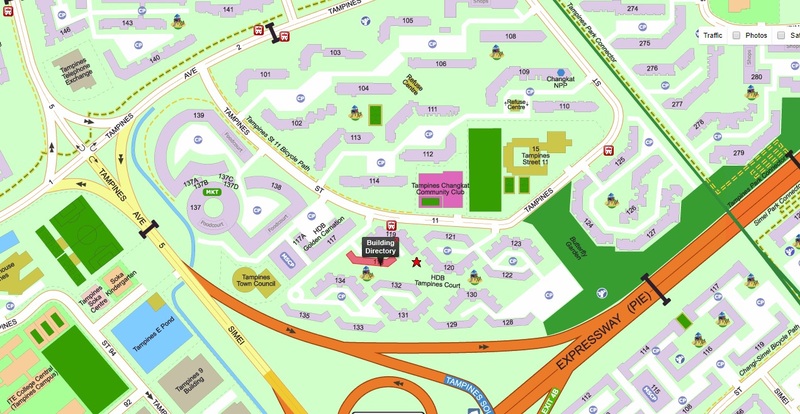 It is located next to Tampines Town Council and very close to a wet market, food centre and other HDB shophouses at Blocks 137, 138 and 139. The drive to Tampines Mall is about 1.2 kilometres and will take 6 minutes. 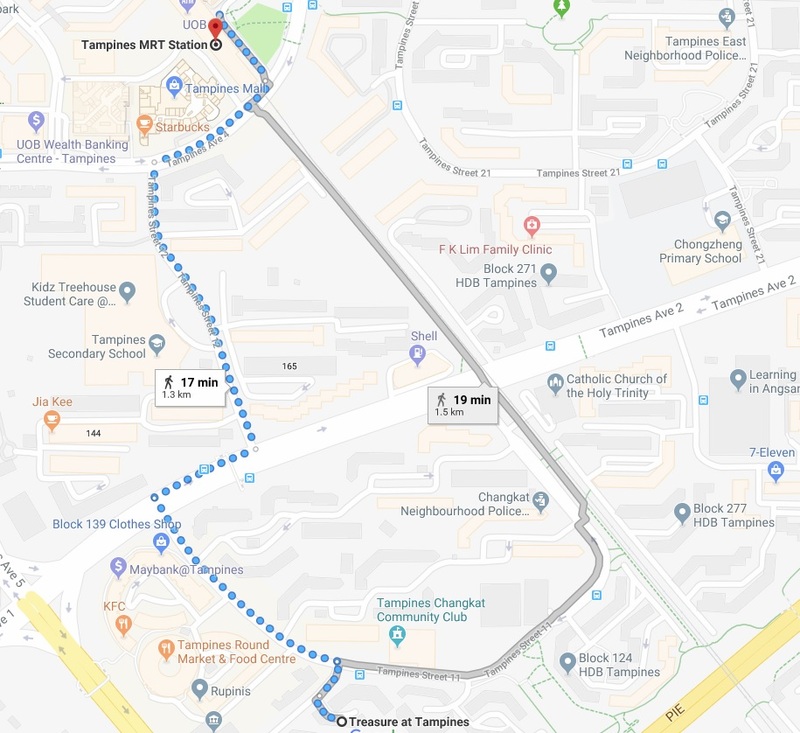 The walk to Tampines Mall will take 16 minutes and will cover 1.2 kilometres. The walk is generally not sheltered, although you can take the longer route as indicated in the map above. Following the grey route would mean walking under the MRT track which is sheltered. The path under the MRT track is also a park connector. 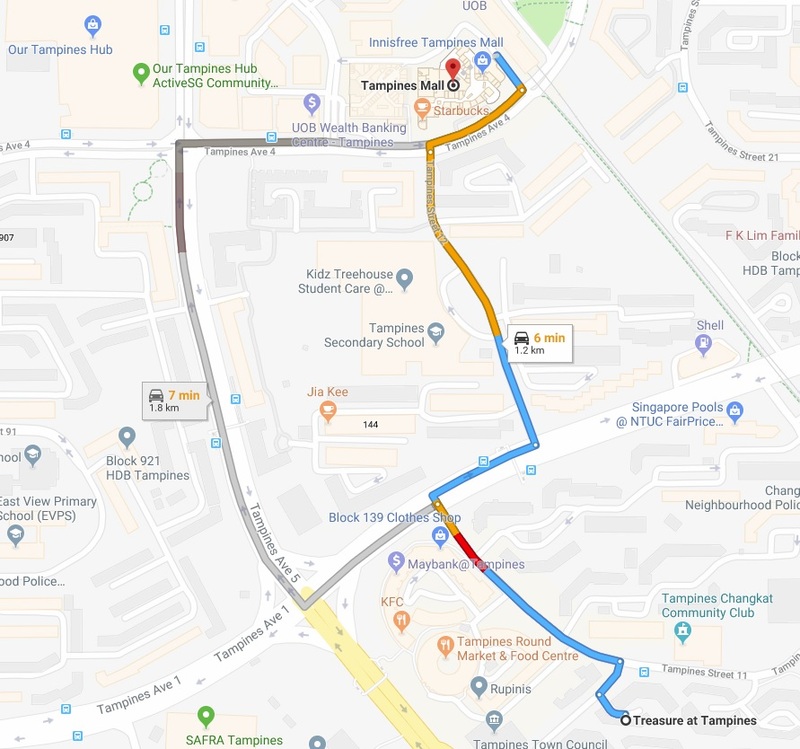 This route will also take you to Tampines MRT Station which is located along the East-West MRT Line. If you are travelling to Singapore’s Central Business District (CBD), it will take you 23 minutes and cost you $1.63. 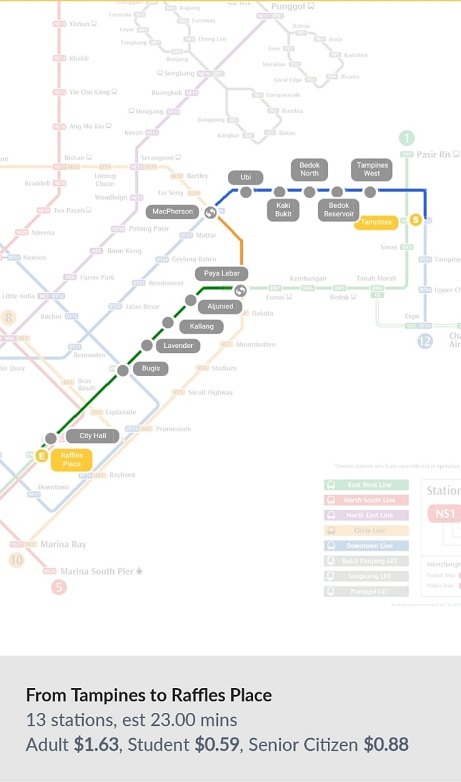 You can take a direct route via the East-West Line or make a few transfers. The travel time is similar. If you are travelling to Orchard Road, it will take you 25 minutes and it will cost $1.71. 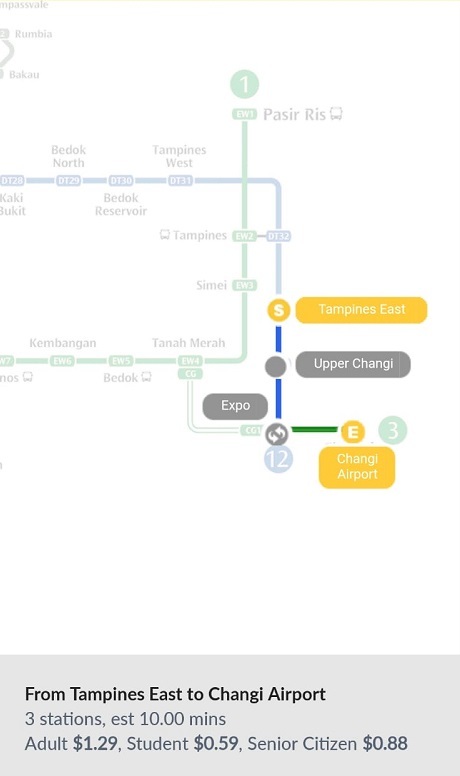 If you are travelling from Tampines MRT Station to Changi Airport MRT Station, it will take you 12 minutes and it will cost $1.39. 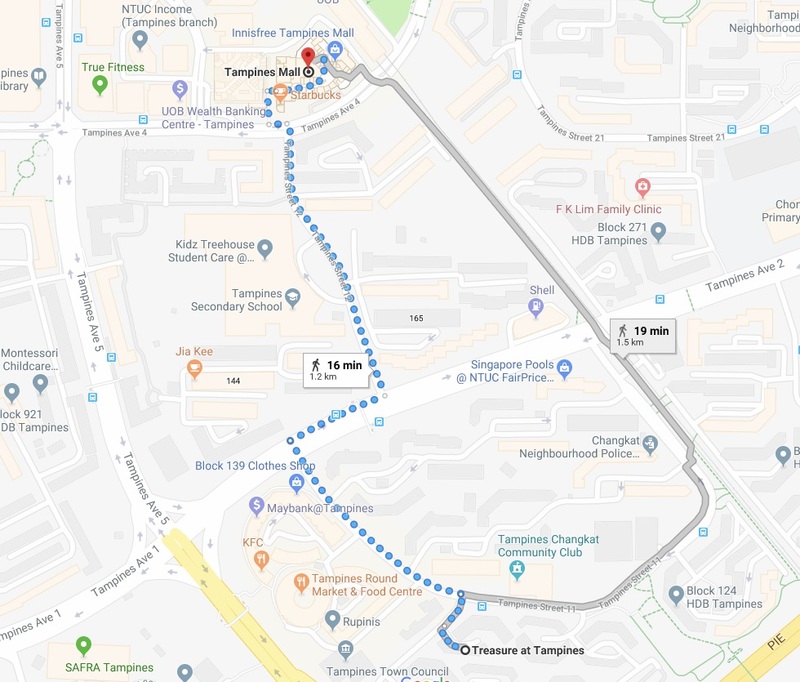 Instead of travelling to Tampines MRT Station, you can elect to cross over the PIE and walk to Simei MRT Station instead. 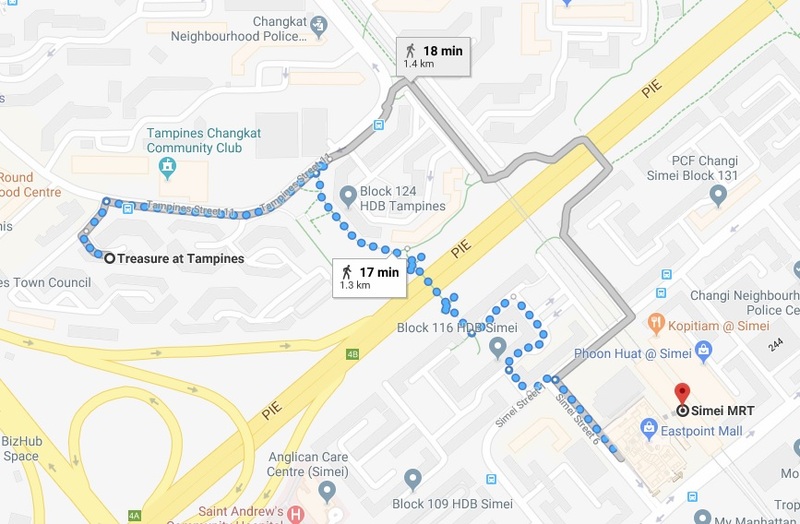 The walking distance and time taken to Simei MRT Station is actually rather similar. In this instance you would be crossing the PIE to get to Simei. From Simei MRT Station, it will take you 22 minutes to get to Raffles Place MRT Station and it will cost $1.63. It is a direct train ride without having to make any switches to any other train line. I would recommend this as the ideal route to take to get to Raffles Place. If you are travelling to Orchard Road, it will take you 24 minutes and cost you $1.67. 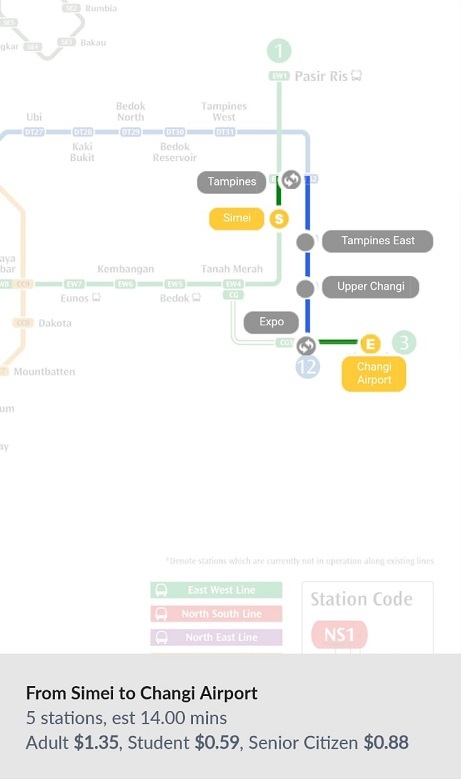 You will need to change to the Downtown Line and then to the North-South Line. 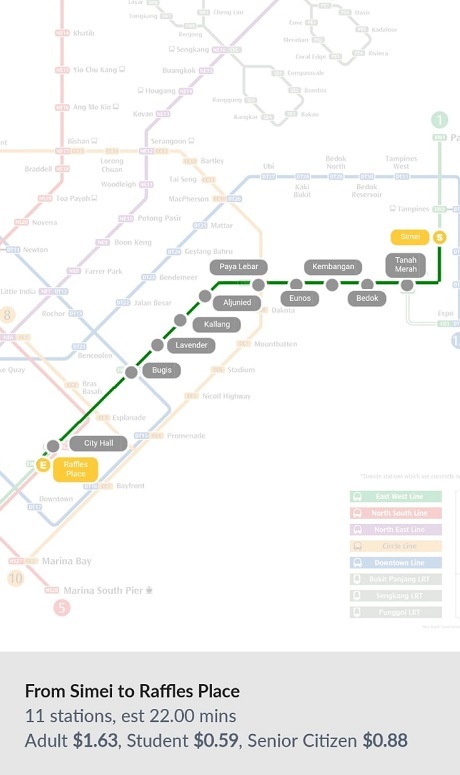 Alternatively, you could change to the North-South Line at City Hall MRT Station. 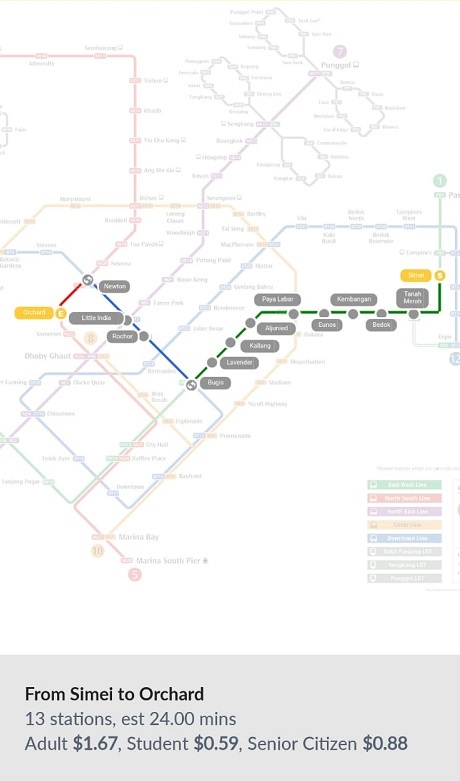 From Simei MRT Station to Changi Airport MRT Station will take 14 minutes. It will cost $1.35. 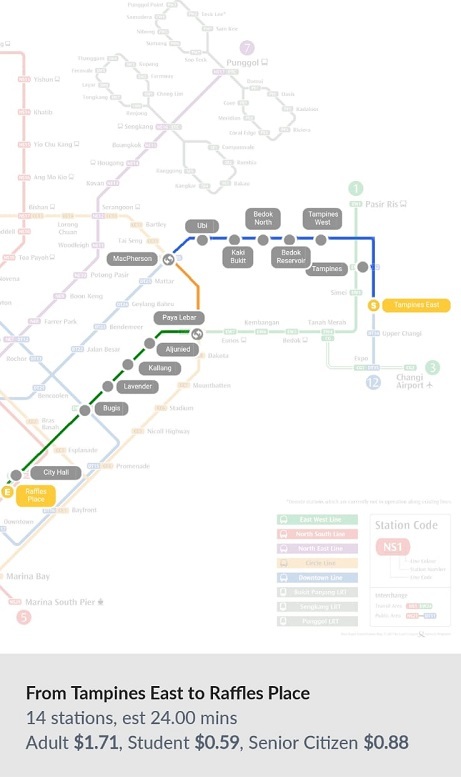 Tampines West MRT Station is the third option for residents at Treasure at Tampines. The distance to walk to this MRT Station is about 1.1 kilometres and it will take about 15 minutes. The route is rather unsheltered. 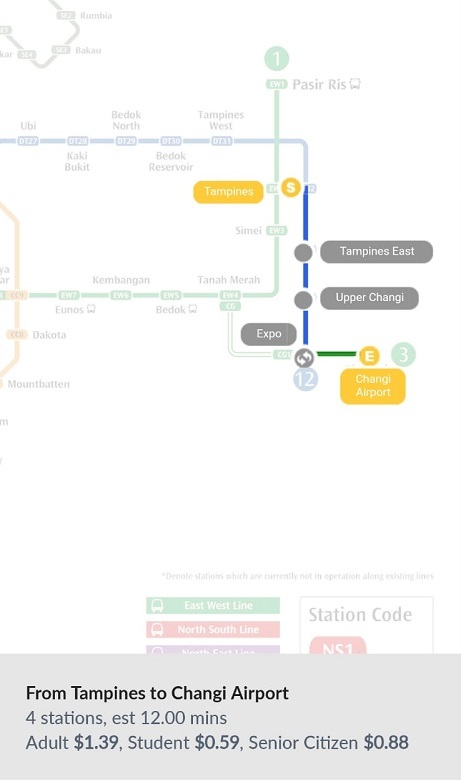 The journey from Tampines East MRT Station to Raffles Place MRT Station will take 24 minutes and will cost $1.71. You will need to change train lines on two occasions. You can also make a change at Tampines MRT Station and get onto the East-West Line which will bring you directly to Raffles Place MRT Station. 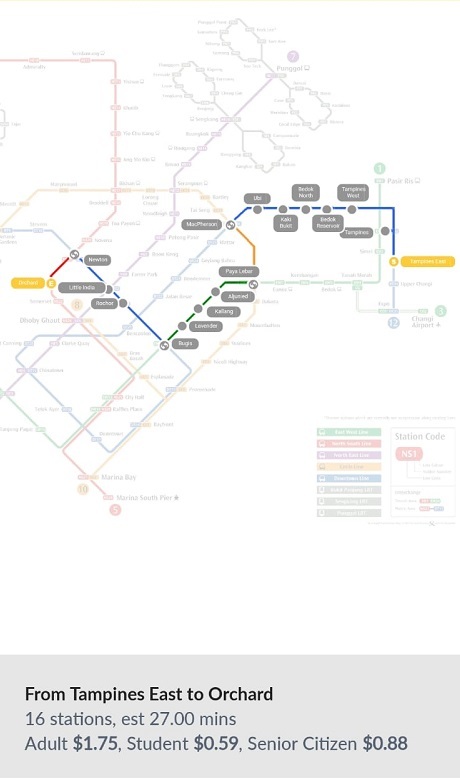 The journey to Orchard MRT Station will take 27 minutes and cost $1.75. The journey to Changi Airport will take 10 minutes and cost $1.29. The main selling point about the development is its size. 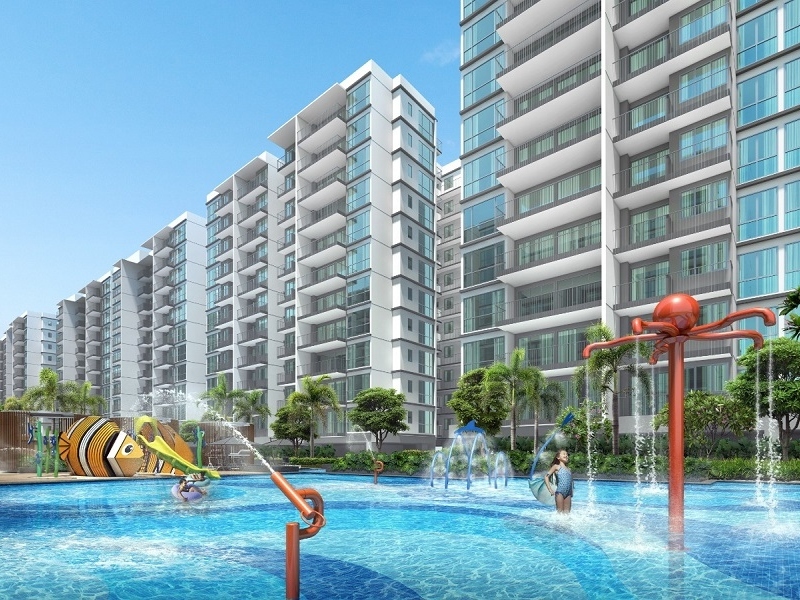 Having 2,203 units gives Treasure at Tampines the edge in terms of economies of scale. On the other scale, there are small boutique developments with very high maintenance charges and yet have extremely limited facilities. In fact, it is not uncommon to see 1-bedroom units in small boutique developments with maintenance fees of about $300 a month. The facilities may just include an extremely small pool and perhaps a BBQ pit corner. Treasure at Tampines will have extremely comprehensive facilities and yet I am expecting the maintenance fees to be reasonable. The facilities should be very extensive. The next selling point would be that it is located right next to a whole range of amenities like a wet market, food centre and many shops in the HDB blocks right next to it. The development is not near an MRT Station. The more sensible option would be to walk to Simei MRT Station which is still about 1.3 kilometres away. 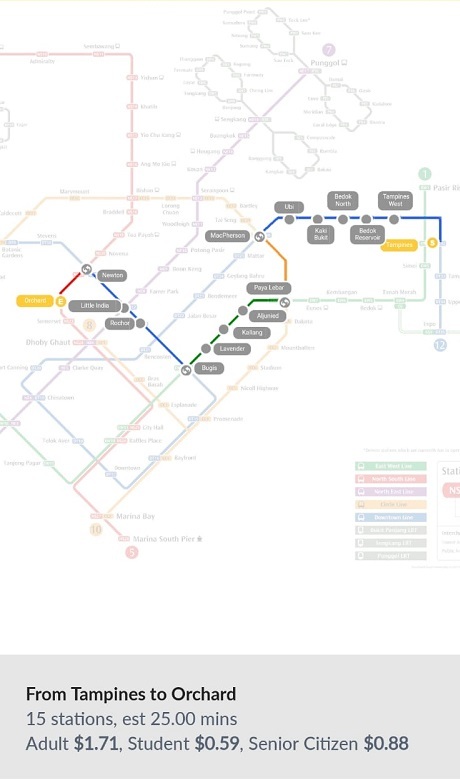 It is almost right in the middle of 3 MRT stations which means that it is not close to any. The walks are not sheltered. The traffic at Tampines Street 11 may be rather congested. As it is, it is a single lane road. Increasing the number of units on this particular plot of land by four times may cause traffic to get even more congested. This was perhaps the reason why Sim Lian had to sacrifice 7 to 8 per cent of the land to build the slip road to the Pan-Island Expressway. Location wise it is perhaps not the best. However, this has been the case for just about all new project launches in Tampines. There isn’t a condominium next to an MRT station in Tampines. Being a new project launch, it should launch at a per square foot price that is higher than those in the resale market. If you are looking to purchase a development in the area to rent out, I personally would think that options in the resale market like My Manhatten and Modena would offer better value. Transactions at My Manhatten are in the price range of around $1,200 to slightly below $1,400 per square foot although there was a one bedroom unit that transacted at $1,518 per square foot in August 2018. Modena prices are in the $900 to $950 per square foot range. These developments are situated right next to Simei MRT Station and would attract tenants easily. They may be older developments but if I were looking to purchase a unit to rent out, proximity to the MRT station would be of paramount importance. Also, having 2,203 units would mean really intense competition for tenants. Even though this development is not one to buy to rent out, it should excel as a good development to buy for own stay. 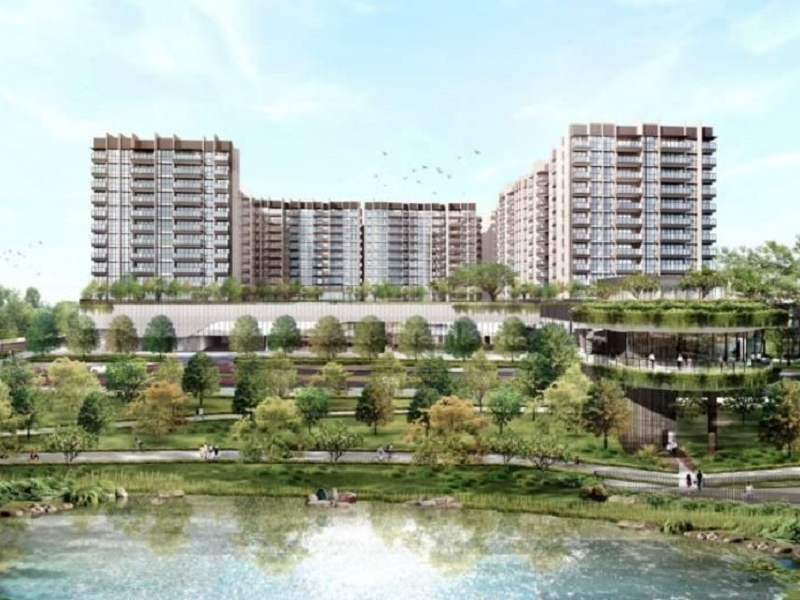 I do believe that if the pricing is set to somewhere around $1,300 per square foot thereabouts, this development could prove popular with HDB upgraders in Tampines. Having such a large development would mean that the facilities will be very comprehensive and yet maintenance charges can be kept affordable. Any client purchasing Treasure at Tampines should purchase for their own stay. Selecting a good unit should be challenging though, with so many units on offer. If buyers purchase the right units, i.e. those with prime facing and optimal layouts, they could do well in the long run. It would be wise to remember that there are 2,203 units and when buyers intend to sell, competition is going to be fierce. It would be important to select the prime units or units with unique selling points which would stand out in the resale market in future. I do think that the location is not the most ideal as it is not near to an MRT station and it is located along a very small road. I do think that there may be some congestion along Tampines Avenue 11 when Treasure at Tampines is completed. Sim Lian Group is a very experienced developer. It is very experienced in developing mass market condominiums. 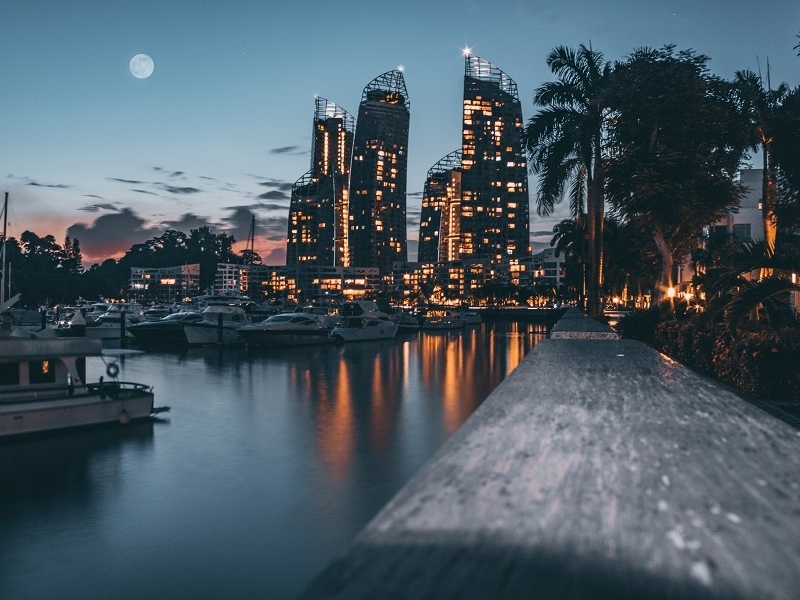 Its recent developments include Treasure Crest in Sengkang, Wandervale in Choa Chu Kang and Hillion Residences in Bukit Panjang. I particularly like their past development Clover by the Park in Bishan. Sim Lian Group does put great thought into their developments with well thought out layouts. p.s. Disclaimer: I am a licensed real estate salesperson at the point of writing this review. My real estate agency is the marketing agency for Treasure at Tampines. Buyers can approach me to purchase Treasure at Tampines and I will earn a commission from the developer. My reason for writing this review is to share my personal view about the developments not as a real estate salesperson but in the neutral context of a buyer and hopefully share some insight to help buyers make a more informed buying decision. 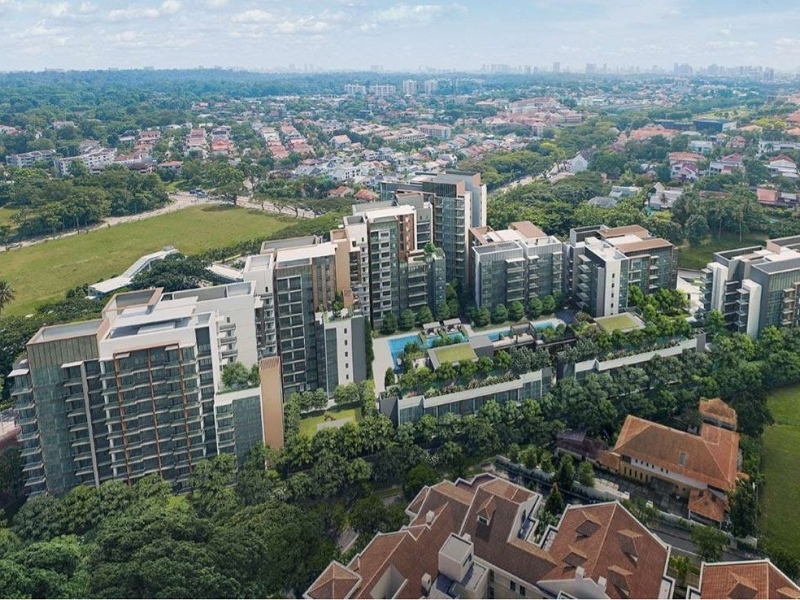 You can access more information, floor plans and price lists, about Treasure at Tampines and other new project launches here. Are Singapore property prices too high? P.S. I have just started a YouTube Channel and I will be uploading weekly videos explaining the various investment terms and jargon which may come in handy for some. Do consider subscribing to my YouTube Channel for useful investment content videos. You can access my YouTube Channel here.